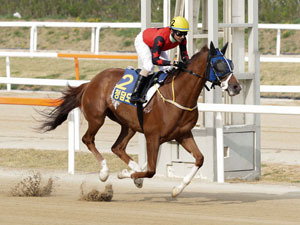 Gaon Champ steps up to class 1 for the first time in Seoul’s feature race this Sunday. The exciting three-year-old has solid claims in the 1400M Handicap, the concluding race 11, but he’ll have to overcome track record-holder for the distance, Sanggam Mama, if he is to do it. Talented but fragile as a juvenile, winning three from three, Gaon Champ didn’t begin his three-year-old season until the Sports Seoul Classic trial here in March. There he suffered his first defeat going down to eventual Korean Derby runner-up Mask on what remains the only time he’s tackled seven furlongs. He went to the first leg of the Triple Crown, the KRA Cup Mile in Busan but after becoming very fractious in the gates, ran poorly and finished in 6th. Gaon Champ has only raced twice since and has been a facile winner on both occasions. Both were at 1200M though, so it is a big test for him here. Sanggam Mama is dangerous, especially from the front as he was when running 2nd in a similar race just two weeks ago, but he seemed to feel the 58kg he was carrying that day in the closing stages and he receives exactly the same impost this time. It was a disappointment to many in Korea that Gaon Champ skipped September’s Korea Sprint. That may have been too much too soon but on Sunday, we get a chance to see what he’s made of. After a four-month absence, Italian trainer Luigi Riccardi recently returned to the training ranks at Seoul. While he was away most of his horses went elsewhere but he has one of them back now as well as some new ones and his return got off to a promising start when debut-maker Mamma Roma – his only runner last weekend – ran a good 4th last Saturday. Riccardi is a trainer worth watching with a win rate of 19% and no fewer than 46% of his runners finishing in the first three. In race 9 on Sunday, he saddles Lucky Rookie, a winner of three from eight, including a really good five-length win at the same class and distance on October 13th. He carries an additional 5kg this time but under French jockey Johan Victoire, he could well have enough about him to get the job done once more. There are 11 races at Seoul on Sunday from 10:45am to 6pm local Korea Time.